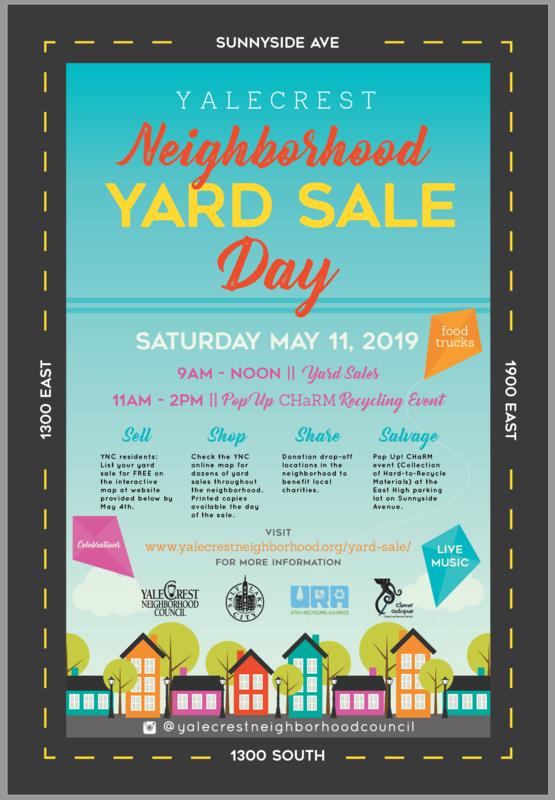 The 3rd annual Yalecrest Yard Sale Day will be on Saturday, May 11, 2019 from 9am to noon. Neighbors will be able to register for free and set up a yard sale at their own residence while activities take place throughout the neighborhood! The POP UP Charm Recycling Event will take place in the East High parking lot (upper lot) from 11am to 2pm. There will be live music, food trucks and Clever Octopus (arts and crafts) at Laird Park from 11:30 am to 1:30pm. Tip #1 PREPARE: A week before the sale, start organizing, sorting, and pricing. The day before the sale, group everything so that we could move everything out into the driveway/lawn in an organized manner, not a chaotic mess. Create a plan for what was going to go where, how it would be laid out, how many tables, shelves, clothing racks, etc. we needed and gathered them up. Essentially, prepare for several days.